After the successful debut of The Infamous Kit Vol. 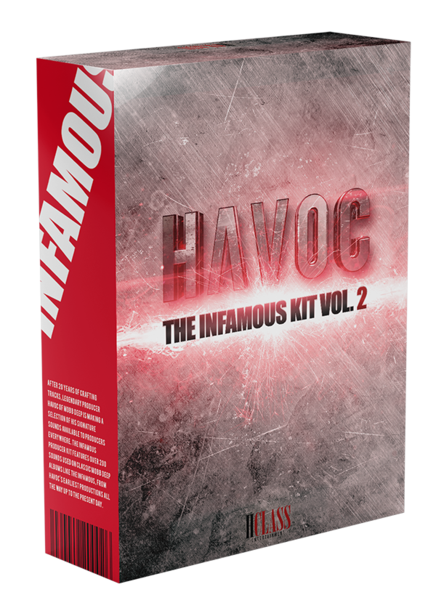 1, legendary hip-hop producer and Mobb Deep group member, Havoc, announces the release of The Infamous Kit Vol. 2. The Infamous Producer Kit Volume 2 features over 130 sounds used on classic Mobb Deep albums from Havoc's earliest productions all the way up to the present day. "I'm looking forward to giving fans and up-and-coming producers a piece of that Queensbridge sound that I'm known for. They'll be able to take my signature sounds and really be able to put their own spin on them. ", says Havoc. Features 130 drum sounds of Vintage Kicks, Snares, Hi Hats, Breaks, Claps and more.